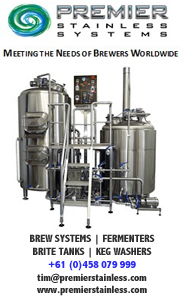 Moo Brew is a brewery that’s always had art at the centre of everything it does – or, more accurately, wrapped around everything it does – ever since launching with John Kelly's pieces on its labels. 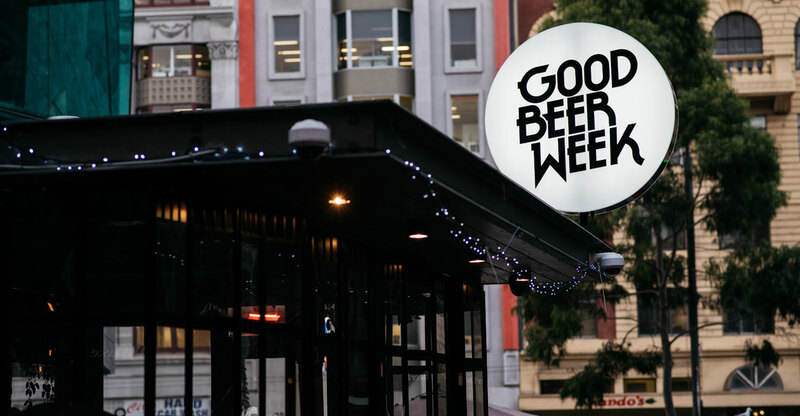 Similarly, Good Beer Week is a festival that’s always been about more than just beer, embracing everything Melbourne and Victoria has to offer. 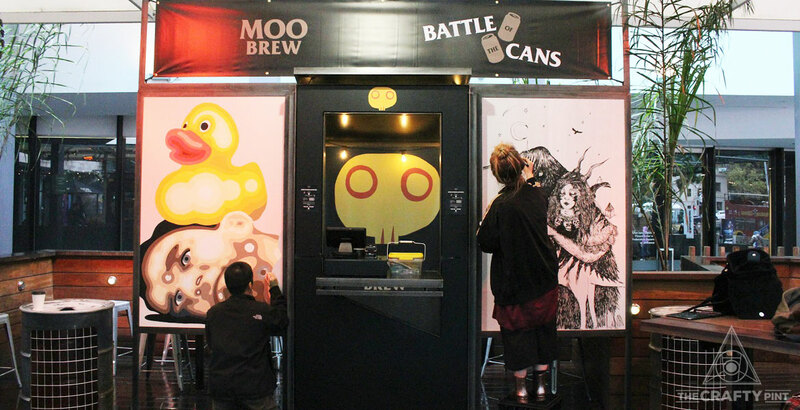 Now, in the hours before Australia’s largest beer festival launches for the eighth year, Moo Brew has invited two artists to battle it out on canvas to see who gets their artwork onto Moo’s next can. The victor won’t have to wait long to see the spoils either, with the move from canvas to can taking place over the space of five days. The creative clash is also acting as something of a State Of Origin battle between Hobart’s Brain Foetus and Melbourne artist Kenz. The former's work involves imagery of characters and narratives that are often inspired by nature while Kenz draws influence for his artwork from stages of dreaming. Moo’s long association with the creative arts stems from the brewery being within businessman David Walsh’s empire, one that, these days, is centred around the Museum of Old and New Art (Mona). 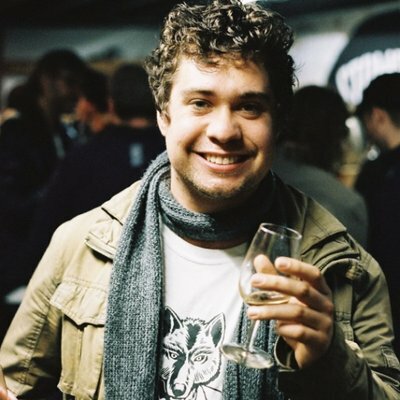 As such, Dave Macgill, Moo Brew’s head brewer and general manager, says the idea of having an interstate battle between local artists was a natural fit for the brewery. “That’s always been a part of Moo Brew’s culture, having original artwork on labels, and it’s a good opportunity to showcase local artists,” Dave says. The Good Beer Week Festival Hub. Photo by Simon Shiff. Those who make it to the Good Beer Week Festival Hub, Beer DeLuxe Fed Square, over the first weekend of the festival can vote for their preferred piece with beer cans grabbed from Moo Brew’s pop-up bar. By Sunday night, whichever artwork ends up with the largest pile of tinnies will be crowned the winner. Victoria’s PakCan Logistics are charged with taking over from the artists come Monday and turning it into a label for Moo Brew’s 2018 Harvest Ale. The harvest beer is an XPA made with 70 kilograms of fresh Enigma from Hop Product Australia’s Bushy Park farm and there’s only 30 cases of the beer to go around. With no way of knowing what either Brain Foetus or Kenz have planned, the effect the artwork might have on Moo’s branding could be a cause of concern. For his part, Dave remains unfazed. “If I was too worried about weird artwork I’d probably be more concerned about some of the Mona stuff,” Dave says. Spending time living in the UK (and backpacking across Europe) when I was 21 certainly gave me a better understanding of the beer and different styles of the world. But I'd say it was a holiday to the High Country a little while later when lunch and a tasting paddle at Bridge Road Brewers created an obsession with Australian breweries and locally made beer. Boatrocker's Miss Pinky: It's a raspberry-packed Berliner Weisse that neither looks or tastes the way many people conceive of beer. Bad Shepherd Hazelnut Brown: A luscious mix of chocolate and hazelnut that can appeal to the sweet tooth within us all. Stone & Wood Pacific Ale: As the father of my oldest friend once said to me: "It's the perfect refreshing pint that smells like they've loaded it with the God's herb." Garage Project's DFA while sitting at the bar at Miss Moses as the sounds of The Rolling Stone drifting in the background.